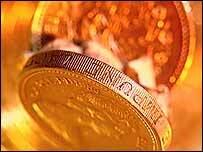 The UK pound has climbed past the $2.10 level against the US dollar, the highest it has been in 26 years. At one point, the pound touched $2.1052, before paring gains to trade at $2.1042. The weakness of the dollar has also seen the euro benefit, with the single European currency strengthening to record levels against the greenback. Analysts said the dollar had weakened because of speculation that US interest rates would be cut in coming months. They also said it reflected fears that China may start offloading some of its huge dollar currency reserves in favour of other foreign currencies. And predictions that the Bank of England's monetary currency committee may keep interest rates at 5.75% on Thursday have also favoured the pound. The dollar and pound were last at similar levels in September 1981. Earlier, the euro jumped to a new record against the dollar, as it moved to beyond $1.47. Another currency performing strongly against the greenback is the Canadian dollar, which currently buys more of its US counterpart than at any time since 1950. In early trading on Wednesday, the "loonie", as the Canadian currency is affectionately known, broke through the $1.10 mark. James Hughes, an analyst at CMC Markets, said: "The rally is being driven by dollar weakness as opposed to pound strength." He added: "Speculation that the Chinese government may further diversify its currency reserves is being seen as largely responsible for this move." And further speculation that oil-exporting nations have been selling dollars earned from petroleum sales to buy more euros has also boosted European currencies. The fall in the value of the dollar put pressure on global stock markets, with the Dow Jones index closing down more than 2.5% in New York. The FTSE 100 also closed lower in London, with dollar-exposed firms such as British Airways and Royal Bank of Scotland being punished by investors. Mr Hughes said: "The big move [in the dollar] has caught people by surprise and it has affected the US futures market, which is weighing on indexes in Europe and London." Other analysts said a strong euro and sterling against the dollar would harm European firms' earnings. "In some company reporting, we have seen the impact. BMW and paper companies have mentioned it in their reporting," said Bernd Meyer, a strategist at Deutsche Bank.